Random Act of Kindness #32 – Black Friday BLOWOUT! Woo-Hoo! 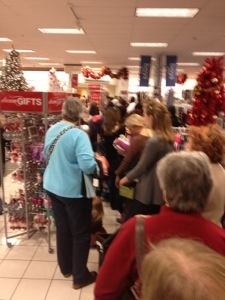 Welcome to the wonderful world of BLACK FRIDAY! To say that I look forward to this one crazy shopping day of the year is a complete understatement. I cannot WAIT for Black Friday to arrive! I love so many things about this day: The excitement! The energy! The reduced prices! It’s the one day of the year where I am guaranteed to be child-free, can shop for 10 hours straight, spend money without worry, all the while getting the majority of the items on my Christmas list marked off. For me, Black Friday is the ultimate day of productivity. Now I know several friends of mine will read this and roll their eyes. “Black Friday shopping? Who in their right mind would do THAT?! ?” And… they’re right. It takes a really special shopper to tackle the crowds on Black Friday. But what greater opportunity is there to show kindness to others? This year I was extra excited about Black Friday, because I was already plotting ways I could deliberately bless others on such a maddening day. The first thing I did was stop by a Starbucks. After all, shopping in and out of stores where the temperature was a frigid 29 degrees outside… one might need a little pick-me-up to make the adventure more bearable! 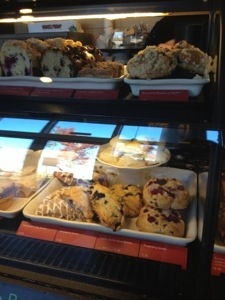 As I stood in line to get my tall salted caramel mocha, my gaze wandered across the yummy muffins and pastries. I immediately thought of my family members who were stuck working retail jobs on Black Friday. What types of customers would they encounter today? Would their day end in satisfaction or exasperation? I decided that a surprise treat might be just the thing to put a smile on their faces. 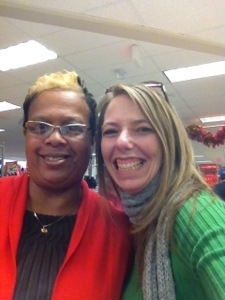 My first stop was JCPenney’s to surprise my cousin, Becky. It took me about 20 minutes just to find her in the sea of customers waiting in the checkout line. 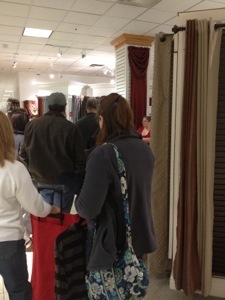 That’s her on the far right side – you can barely see her from the back of the line! 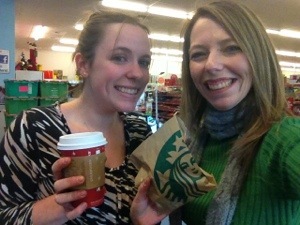 My next stop was on the other side of town to surprise my sister, a shift supervisor at CVS. Thankfully there are Starbucks coffee shops all over the place, so I was able to grab a hot drink and a muffin to bring a smile to her day. Back in the car, I was excited to start shopping. But first I had to get to the stores! Have you driven around on a Black Friday? Just the driving alone might send you fleeing back to the safety of your home. But I was determined to show kindness, even in my car. 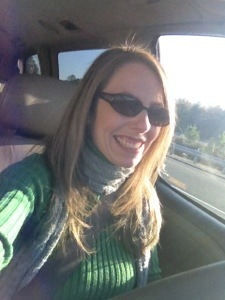 I smiled and waved at complete strangers, patiently allowing them to merge in front of me as they went about their way. Almost to the local mall, I thought about families who weren’t as blessed as me to have the ability to shop on Black Friday. So many families are struggling this time of year, especially with unforseen layoffs and other monetary challenges. While adults can understand these constraints, it can be really hard on the children. 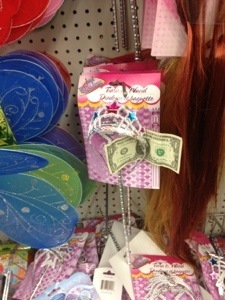 I decided to make my next Random Act of Kindness focused on kids. Yes! 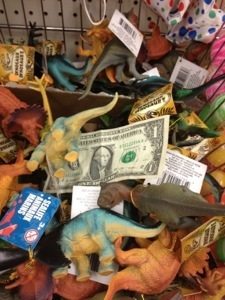 I went into this store and hid three one dollar bills among different toys, all at a child’s eye level. SO MUCH FUN! 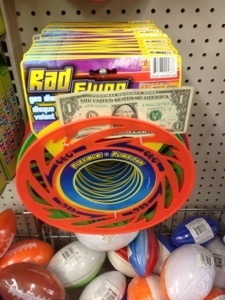 I really wanted to wait and see a child discover the money, but there wasn’t a single child in the store. However, as I was headed to my car, I saw a mom with three (THREE!) 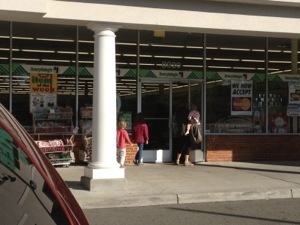 children walk into the store. It was a divine setup! I knew without a doubt that my being at that store, with that specific Random Act of Kindness, was nothing short of God showing his love to his children. It literally gave me chill bumps! When you stand in line for over an hour just to spend money on gifts for other people… well, you have lots of time to think, listen, and learn. I’ve discovered that patience (not necessarily a strength of mine), is an essential skill for withstanding the trials of Black Friday shopping. Oh, how many times I could have lost my patience!! But what would have been the end result? Would it have gotten me closer to the finish line (a.k.a. Customer Service)? Nope. So why lose patience over something I have aboslutely NO CONTROL over? I chose to go shopping today. 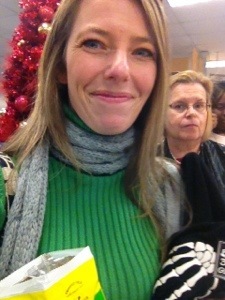 I chose to shop at the store with the really good sale prices and free coupons. Standing in line was simply part of the process. So why complain about it when I was here BY CHOICE? The gal behind her was now behind me. I remembered her telling a story about her grandson scratching off all the discount scratch-off coupons (thus making them invalid to use). As she was called to the register beside me to purchase her items, I quietly slid my 15% off coupon to her with my business card and a smile. 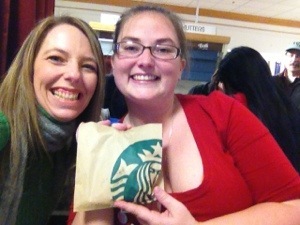 She was touched by my generosity, promised to pay it forward, and agreed to take a picture for the blog. Can you see our joy for finally crossing the finish line? But this Black Friday Random Act of Kindness BLOWOUT would not have been possible were it not for my husband and children left behind at home. Yes, this was my day to do as I pleased. But it wouldn’t be right to have this much fun and not include them. 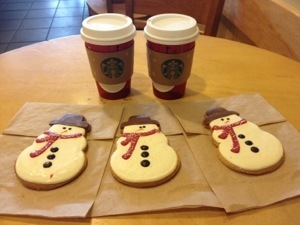 So as I left my last store, I made yet another stop at Starbucks and picked up some coffee for me and my husband and some sweet treats for the kids. It was a small gesture to say “Thanks!”, but one I knew would make them smile. So, as you are reading stories of how horrible Black Friday is, and how mean people can be, just remember there are a FEW people out there who are truly trying to make a difference in the midst of it all. I really do love Black Friday in all its chaos and confusion. Where else can complete strangers find commonality in their craziness? Be blessed my friends! May your holiday season be filled with peace, joy, and love wherever your travels take you!